Arctic terns that make annual migrations farther than any commercial airline flight. Elephant seals that measure ocean temperature under the ice shelves of Antarctica. Warblers that detect incoming storms and fly out of harm’s way. Sea turtles and pythons that possess internal compasses to navigate. A young wolf who traverses the Alps in the depths of winter—and finds a mate on the other side. 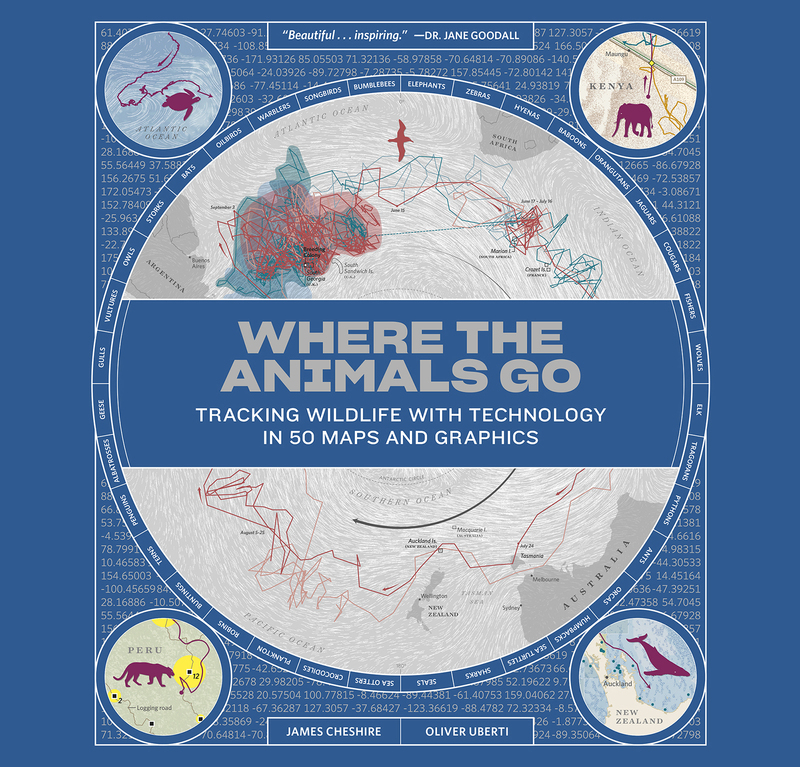 Through stunning, four-color charts and maps, Where the Animals Go by James Cheshire, Associate Professor at University College London, and Oliver Uberti, helps shed light on the techniques scientists use to gather data and understand and predict animal behavior. From cutting-edge magnetic collars to tags made with cork and piano wire, scientists are tireless in their efforts to track and study animals using a balance of cutting-edge technology and good, old-fashioned scientific methods. This book, which Jane Goodall says, “is beautiful as well as informative and inspiring. There is no doubt it will help in our fight to save wildlife and wild habitats.” It put the fruits of this scientific research and labor on gorgeous display in an immensely approachable manner. Join us at this special Science on Tap where co-author Oliver Uberti, award-winning designer, visual journalist, and former senior design editor for National Geographic, will talk about this triumph of technology, data science, and design, that brings perspective and intimate detail to our understanding of the animal kingdom. James and Oliver’s best-selling debut, London: The Information Capital, won three British Cartographic Society Awards for cartographic excellence. This event is in partnership with Wordstock: Portland’s Book Festival, brought to you by Literary Arts. Books will be available for sale and signing, brought to you by Broadway Books.